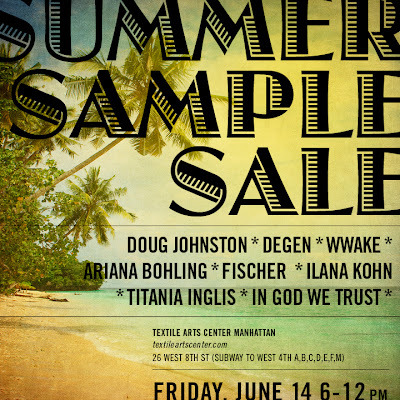 TITANIA INGLIS / NEWS: Summer Sample Sale this Friday! Summer Sample Sale this Friday! This Friday evening, we'll be offering discounts on past- and select current-season pieces at the Textile Arts Center's West Village outpost, 26 West 8th St. Join us and fellow NYC designers Doug Johnston, Degen, Wwake, Ariana Bohling, Fischer, Ilana Kohn, and In God We Trust for some sweet deals and tasty beverages! 6pm to midnight, ABCDEFM trains to West 4th.